My father was not a winemaker. He was an auto mechanic who opened his own small shop south of Market in San Francisco in the 1950’s. 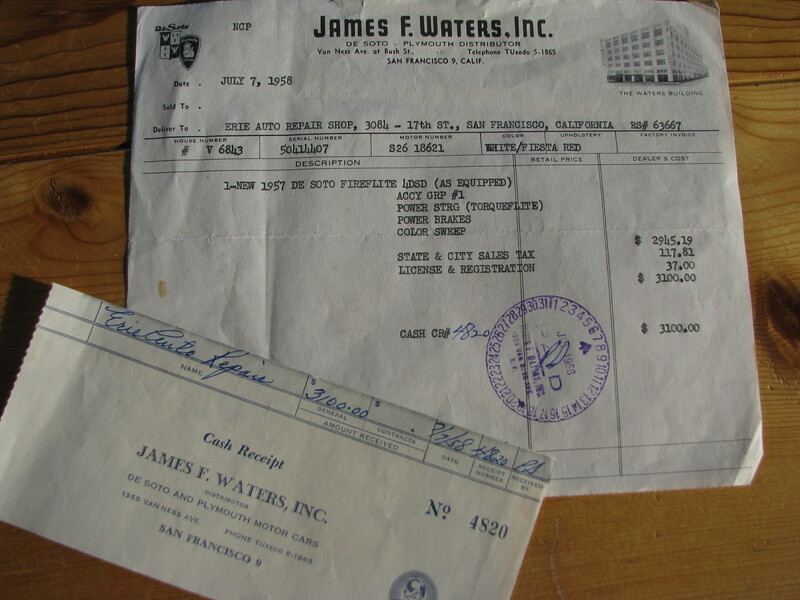 He specialized in the only “real” cars that existed in California back then, American cars and trucks. He was young, with a young family, and he struggled for some time until a bit of money started coming in. It was time to get my Mom a real car. Not just a family car but also a new car. 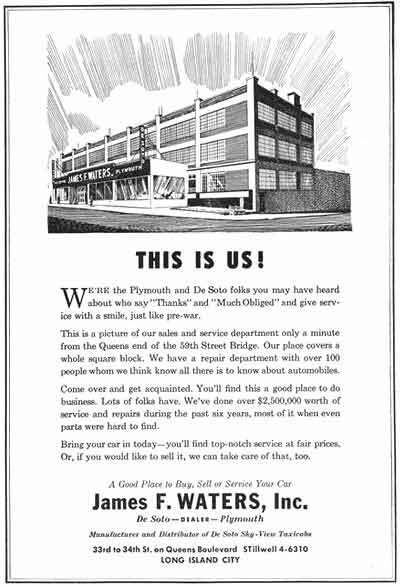 In July 1958 he walked into the James F. Waters Building, what is now Ellis Brooks on 19th Avenue, and bought a 1957 Dodge De Soto Fireflite. He paid cash of course; exactly $3,100.00 ($2,945.19 base price, $117.81 state and city sales taxes and $37.00 in license and registration). Long and low. Red and white. Not fire engine red, but a more muted, happy and sophisticated red. White door panel cut outs with a distinct art deco feel and accented by a thick line of chrome stripping. Matching white roof with beautiful curved corners that continue right down to the curved windshields. Three inch thick white wall tires. A massive chrome front grill with a slightly mischievous look on it. And punctuating the end of the car two impressive fins, rising from its sleek lines, housing three stacked tail lights in each. My oldest sister still remembers vividly the day he first drove it home down the driveway. She thought someone was visiting until she saw it was Dad behind the wheel. For the next 4 or so years my mother drove the car to the bank, to schools, to stores and to church on Sundays. The seats were always covered in plastic. No eating, drinking or smoking allowed anywhere near it. She had a tiny fender bender one day and that was it. She had always been a bit stressed to drive such a nice, new car and with that, the De Soto was moved around but rarely driven again. 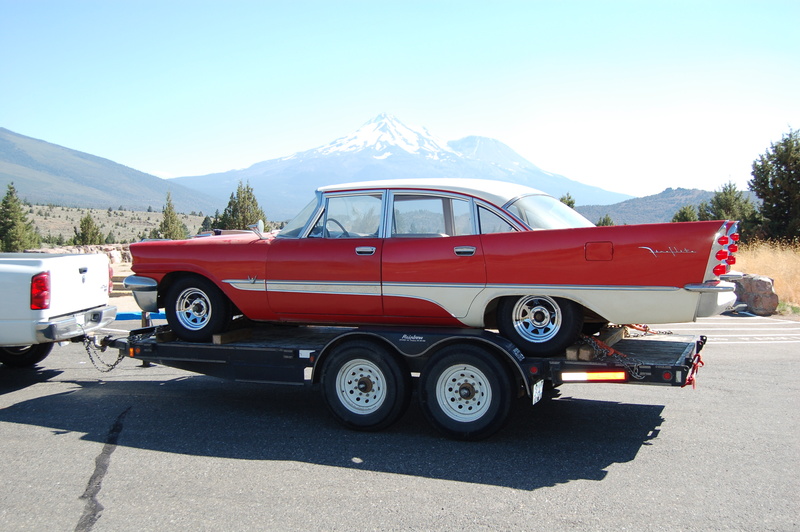 It was finally put into storage around 1966–the year I was born–with just 25,856 original miles on it. To my Dad, a car was and still is, just a car. It is not art, or something to be revered, or collected. It’s just a car. I feel the same way about wine. First and last, a wine is just a wine, not art. Let poetry be written about love, family bonds, lasting friendships and deaths. Not wine. Not cars. Still, this car must have had some special meaning to my Dad because he never got rid of it. Perhaps it symbolized his being able to provide firmly for his family, or maybe he really did secretly love its lines and didn’t want to part with it. 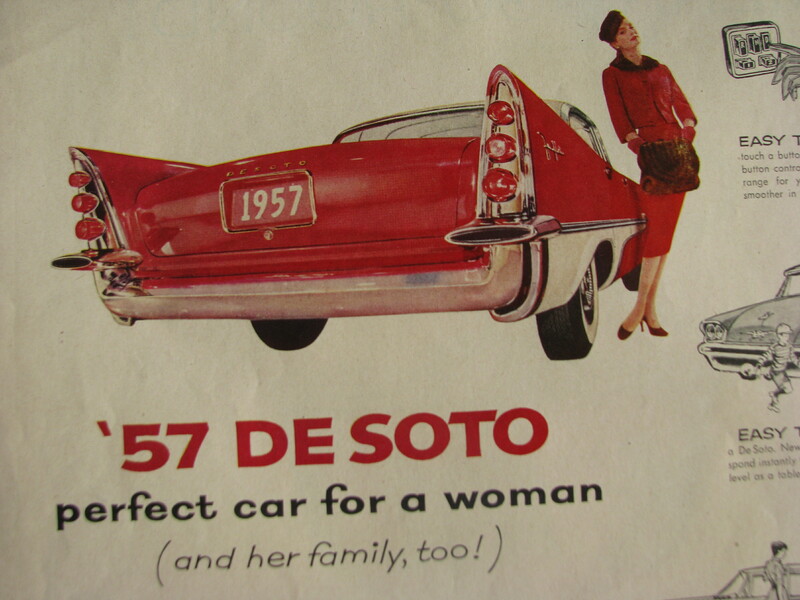 Nonetheless, year after year my Mother faithfully re-registered the ’57 De Soto even though it remained up on blocks. It was moved one last time in 1982 to a small shed on a property my parents owned and sealed with a bike lock. Each year that passed my Father assumed he had stored it incorrectly. Perhaps mice had gotten in, or mold and rust had taken over. Why think anything else? The shed was rickety and was bombarded by Northern California elements of wind, constant rain, summer heat and even a flood or two. 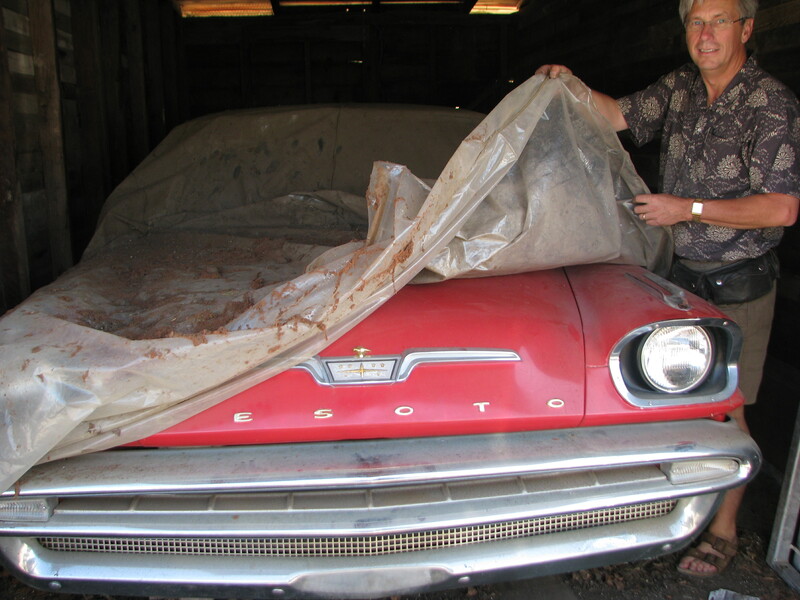 He told me a few years back, when I was pining for the car, begging him to sell it to me, that he imagined it destroyed. Beyond repair. He could not bear to see what he had done to it. So he never looked. In 27 years he never looked. He had made certain before I arrived that he had finally looked at the car. He was pleasantly surprised that it was, for lack of a better word, pristine. Time itself hadn’t even touched it all those years. It came up to Oliver on a flat deck, and spent its first winter in the Okanagan being worked on here and there. Really, there was not much wrong with it. My husband saw its value, its importance in my life and he gave it the care it needed. It seemed to me the car really just wanted to feel the road beneath its wheels and I wanted my Dad to see it running again. 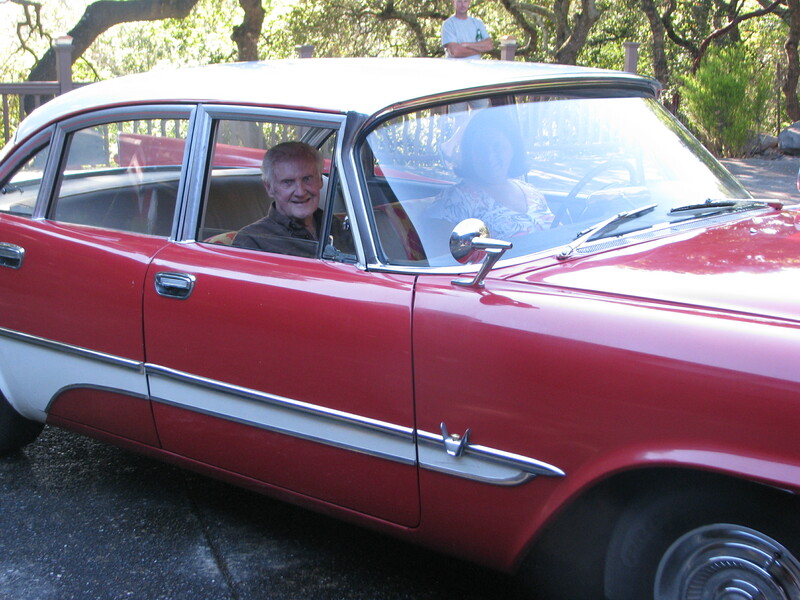 So on July 30, 2010 we drove the family De Soto back to California and down my Dad’s driveway, as he had done for his children 52 years earlier. I’m proud to be my father’s daughter. I’m proud that it’s not wine but motor oil that runs through my veins. This entry was posted in Cars, Personal Sandra and tagged 1957, Dad, De Soto, San Francisco. Bookmark the permalink. I’m a writer and photographer, among other things. So I read alot of personal histories. But I have to say, Sandra you show twice the writing talent of the vast majority of bloggers, with an authentic voice that’s rare online. I admit, I had to reach for a tissue for my eyes when I read this entry. Of course, you realize I must now come photograph this rather hot car. How great to have a family treasure like that preserved and to be able to share it with him! Thanks Alyx. I think he was pretty touched to have us drive it all the way down from BC but he also thought we were crazy! Your Dad and mine are the same age. I really appreciate you taking the time to write this tonight. Change with people close to you is sometimes so hard.